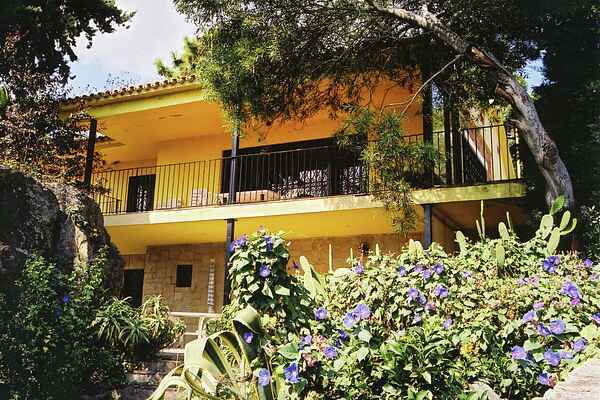 Casa Amarilla is the resounding name of this pleasant holiday home nearby Lloret de Mar. It's part of the Finca Soleada estate, the sunny estate. This is what you will find in the urban area Roca Grossa, which means as much as 'large rock'. The name wasn't chosen without a reason; there's a rock in the centre of the garden that appears to once have fallen from the sky. The house is divided into two levels. This offers befriended families, but also families on their own, many options. Both floors have an entrance on the ground floor. Together with the other residents of the property you share several amenities: the lovely swimming pool with sun terrace that invites you to float in the pool or swim your lengths, and the tennis court. You only have to descend one set of stairs to reach the pool or tennis court. Both are comfortably lighted in the evenings. If your holiday is also about outdoor experiences, then Casa Amarillo is the place for you. You are close to Lloret de Mar with its countless facilities. Restaurants, shops, (tapas)bars and nightclubs. For daily shopping, you can go to a small supermarket nearby (700m). A larger supermarket is a hop, skip, and a jump away (1km).